Our i-Fect Transfection Kit continues to be a potent tool for testing the impact of altered gene expression on behavior. see: SACHIN MOONAT. The Role of Amygdaloid Chromatin and Synaptic Remodeling in Anxiety and Alcoholism. THESIS Submitted as partial fulfillment of the requirements for the degree of Doctor of Philosophy in Neuroscience in the Graduate College of the University of Illinois at Chicago, 2014. Figure 1. Chromatin remodeling via histone acetylation and DNA methylation regulates gene transcription associated with changes in synaptic plasticity. During gene transcriptional processes, the chromatin structure associated with DNA to be transcribed is in a relaxed chromatin conformation due to hyperacetylation of histone proteins and hypomethylation of DNA, which allows access to transcriptional machinery. This relaxed chromatin structure results in increased gene transcription, which in neurons may cause increased expression of synaptically active proteins that result in the positive modulation of synaptic plasticity, such as increased dendritic spine density (DSD). DNA methyltransferase (DNMT) methylates DNA at CpG islands, leading to hypermethylated DNA and recruiting of methyl-CpG binding domain protein (MBD) complexes which block binding of transcriptional machinery. The MBD complex can in turn recruit histone deactylases (HDAC) which remove acetyl groups from histone proteins resulting in chromatin condensation thereby decreasing gene transcription. HDACs and histone acetyltransferases (HAT) control the histone acetylation profile, such that HDACs remove acetyl groups and HATs add acetyl groups to histone proteins. In this manner, increased HDAC expression results in hypoacetylation of histones leading to a condensed chromatin structure. 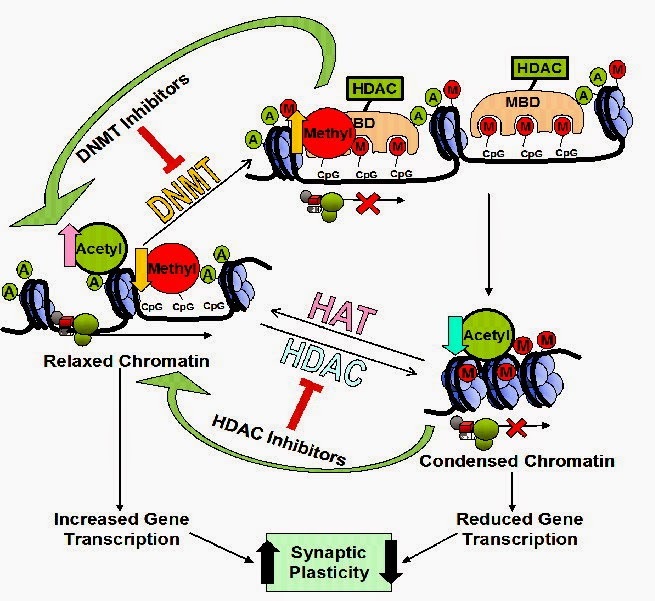 Chromatin condensation resulting from HDAC-induced histone deacetylation or DNMT-induced DNA methylation causes reduced gene transcription. In neuronal cells, the reduction in gene transcription may be associated with decreased expression of synaptically active proteins and negative modulation of synaptic plasticity, such as reduced DSD. Treatment with DNMT inhibitors or HDAC inhibitors may block these enzymatic processes and return chromatin to a relaxed state, resulting in increased gene transcription and synaptic plasticity (Moonat and Pandey, 2012). microdialysis probe which seated in the guide cannula and extended 3 mm past the tip of the cannula into the CeA. were collected for further analysis. Figure. The effects of HDAC2 siRNA Infusion into the CeA of P rats on voluntary ethanol consumption as measured by the two-bottle free choice paradigm. Monitoring the voluntary ethanol consumption of alcohol-preferring (P) rats via the two bottle free choice paradigm following infusion of vehicle or histone deacetylase isoform 2 (HDAC2) siRNA into the central amygdala (CeA) demonstrates that high HDAC2 levels may mediate the high alcohol drinking behaviors of P rats. P rats were given access to water and 7% ethanol followed by water and 9% ethanol. On the sixth day of ethanol access P rats received infusion of vehicle or HDAC2 siRNA and consumption of water and 9% ethanol were monitored for sevnfusion. Total fluid intake did not significantly differ between the groups. Values are represented as the mean ± SEM of the ethanol consumption (g / kg / day) and total fluid intake (mL) plotted daily for n=6 rats per treatment group. *Significantly different between the groups. This data suggest reduction of HDAC2 levels in the CeA leads to reduced DSD associated with a reduction in anxiety-like behaviors and alcohol preference in P rats and could prove to have therapeutic value. Researchers using siRNA complexed with our i-Fect ™ transfection regent have successfully knocked down ASIC3 Receptors in vivo. This publication joins the growing parade (starting with Luo et al, 2005) that reference successful modulation of receptors involved in pain using siRNA complexes. These studies all share animal behavior studies showing a marked change in response to pain stimuli after treatment. In this study, Dr. Eric Lingueglia and his team found Peripheral ASIC3 channels are thus essential sensors of acidic pain and integrators of molecular signals produced during inflammation where they contribute to primary hyperalgesia. was monitored by fluorescence microscopy on cryostat sections 24 h after a single intrathecal injection. injections of an siRNA against ASIC3 had induced a knockdown of ASIC3 expression in lumbar DRGs. I will continue to publish updates.